These are valid points, however, Google being Google, they have a fluid term such as “quality” down to an exact science. Continue reading to learn what Quality Score is, why it is important to digital advertisers and how you can use it to properly manage and measure your campaigns on paid search. Welcome to Quality Score 101. Put simply, Quality Score is the score that Google will give to measure the quality of your ads, keywords and landing pages. It is represented as a numeric score between 1 and 10, 1 being the lowest quality, 10 being the highest. The Quality Score you see in your account is the average value calculated over a sample of your ads. It should go without saying that the largest benefit of Quality Score is that it gives you an opportunity to measure the quality of your ads. But why is it important to do this? The most direct benefit a high Quality Score can have is increasing your ROI. Optimizing and improving your Quality Score will most likely lead a lower Cost per Conversion. Wordstream shows there is a direct correlation between Quality Score and Cost per Conversion, the higher your Quality Score, the lower you will pay for a conversion. Quality Score is also important because it is a clear indicator of whether or not your keywords are performing well for a certain set of ads. If your keywords are seeing a low Quality Score, that means your ads are not matching the search intent as well as possible and you may want to consider changing those keywords. Before we dive into how you can use Quality Score, let’s make sure we understand what does and doesn’t matter when it comes to ad quality. 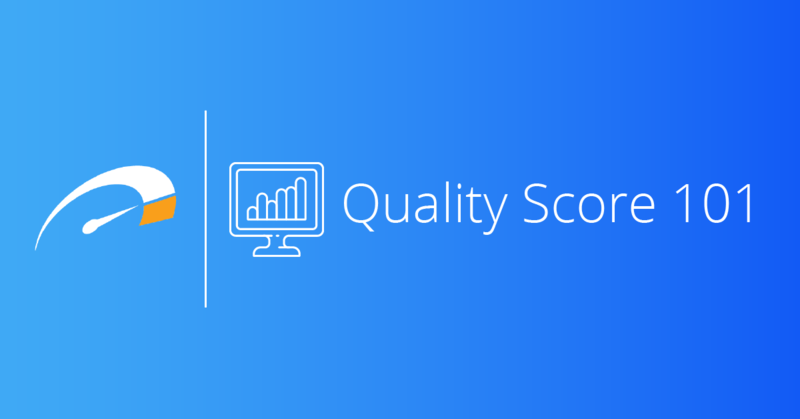 When implementing Quality Score into your digital marketing strategy, it is important to remember that improving the actual Quality Score number should not be your primary goal. Instead, focus on long-term performance and how that aligns with what your Quality Score is and what you would like it to be. Using Quality Score to A-B Test and verify what works and what doesn’t is a great way to use the metric. To summarize, focus on long term improvement rather than tricks to increase your score in the short term. In Google AdWords, Quality Score will also give you an insight into average expected CTR, ad relevance and landing page experience for ads with similar keywords in that time frame. It also tells you if your ads compare better or worse than the average in Google AdWords. Google will show your ad compares to other ads in the Google network with similar keywords in the same time frame. Putting a focus on these 3 aspects is ultimately what will drive more quality traffic and conversions to your site. Researching new keywords, better organizing your existing keywords, refining your ad text, optimizing landing pages and adding negative keywords are all great ways to see a meaningful improvement to your quality score.